Twice a year, 50 restaurants across the country simultaneously pour one iconic wine. 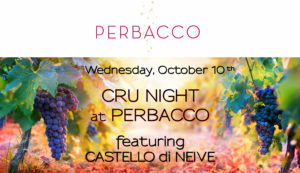 On Wednesday, October 10th join us at Perbacco for this special evening featuring Castello di Neive, a prestigious wine aged gracefully in 3-liter bottles referred to as “Formati Importanti.” Cru Night offers the rare opportunity to taste an exquisitely developed wine that is not usually available by the glass. To make reservations to join us at Perbacco, please click here or call (415) 955-0663. CASTELLO DI NEIVE – Tradition, research, and creativity make up the philosophy of the Castello di Neive winery. The Barbaresco Santo Stefano is the result of an ethereal combination of the ideal terroir with the perfectly-suited Nebbiolo grape. The Nebbiolo grapes for this wine are grown in the Albesani sub-appellation inside Barbaresco, in the single vineyard of Santo Stefano, which is owned entirely by Castello di Neive. What is a Cru? A wine produced from a single vineyard or area of recognized quality. Why Formati Importanti? In Italian, large formats are aptly called Formati Importanti since typically ‘Important’ wines are bottled in larger formats to allow for slow and graceful aging. Formati Importanti take more time to develop and can be aged longer than 750ml bottles.